Situ was born in Guang Dong, Southern China. During the difficult years of the Cultural Revolution, he studied art informally with friends, including Mian Situ. Later, he was able to spend two years at the prestigious Guangzhou Institute of Fine Arts. Following that, he taught art at Kaiping #1 Middle School. 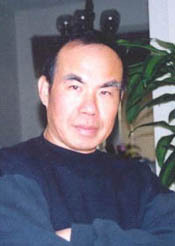 While still in China, he was the head of the Tan River Fine Art Association, Vice-Chairman of the Jiang Men’s Art Education Research Association, and on the Board of Jiang Men’s Branch of the China Artist Association. In 1989, he and his family immigrated to Los Angeles; since his move to the U.S., he has devoted himself to plein air painting. One feature of his work, is that upon finishing one painting, he scrapes all the paint on his pallet into a pile which he mixes and covers a new canvas with the resulting gray paint, to help him catch the subtlety of Western light. Among his many awards, in 1995 he won Best of Show at the exhibition sponsored by the San Gabriel Fine Arts Association, and in April 2001, he won the Oil Painters of America National Award of Excellence. Jason is a member of California Art Club, Oil Painters of America and the Laguna Plein Air Painters.